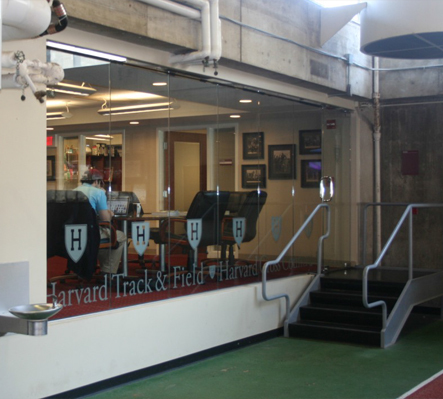 The Gordon Track Lockers and Offices project is a 3,300 square foot renovation undertaken by Harvard Faculty of Arts of Sciences (FAS) to repurpose existing space in the Gordon Indoor Track and Tennis facility, located at 55 North Harvard Street. The Gordon Track and Tennis facility consists of a 6-lane banked oval track, an 80-yd sprint lane, two long jump/triple jump pits, a pole vault runway and multiple high jump aprons. With the newly renovated offices and locker rooms, the facility ranks among the best in the region. Gordon track is the host of numerous meets each season and in recent years has been the site of the Heptagonal and IC4A Championships. The new space, which occupies transition space between Bright Hockey Center and the track includes staff offices, a lounge, and locker room facilities for the women coaches and men's track team. Project scope included the installation of new underground plumbing, HVAC equipment, lighting, and architectural finishes.